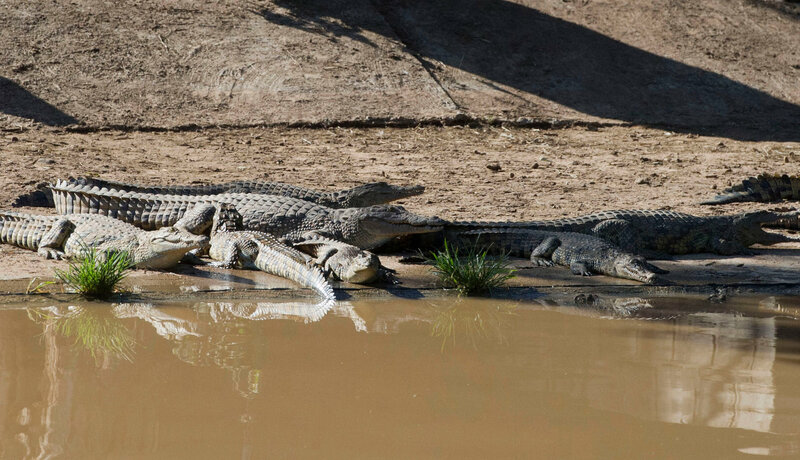 JOHANNESBURG — About 15,000 crocodiles escaped from a South African reptile farm along the border with Botswana, a local newspaper reported Thursday. Driving rains forced the Limpopo River over its banks on Sunday morning near the Rakwena Crocodile Farm. The farm’s owners, fearing that the raging floodwaters would crush the walls of their house, opened the gates, springing the crocodiles, the report said. About half of the reptiles have been captured, with thousands still on the loose. “We will catch them as the farmers call us and say there are crocodiles,” Mr. Langman was quoted as saying. Efforts to reach the farm and the local police directly were unsuccessful, with no one answering the phones. Many of the captured crocodiles were found in the brush and orange groves that line the Limpopo. Most of the animals are captured at night, according to Mr. Langman, who said they were easier to spot because their eyes reflect light. One of them was found on a school’s rugby field in Musina, nearly 75 miles from the farm. Recent flooding has killed at least 10 people in South Africa’s Limpopo Province, which has seen heavy rains for the past week. Local officials are recommending that some regions be declared disaster areas. The authorities in neighboring Mozambique have evacuated tens of thousands of people. Both the South African and Zimbabwean air forces have had to rescue villagers in areas isolated by the floodwaters. The land along the Limpopo is home to dozens of game reserves and crocodile farms, some housing tens of thousands of reptiles.